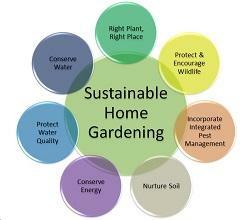 What is ‘sustainable gardening’ and why is it important? First, chose the right plant for the location. Chose plants appropriate to our Mediterranean climate. Use information from our website or from Sunset Western Garden book to determine the correct size plant for your needs. Check that both the size and the climate needs are appropriate to the location. Slow, spread and sink all the water you can to conserve the water that falls on your property. Avoid runoff by using drip irrigation where you can and by using sprinklers more often for shorter run times. Allow rainwater to run off your roof and into the garden rather than into storm drains. Use permeable hardscape so water can be absorbed through your pathways and patios. Make every drop count by eliminating decorative lawn and planting drought-tolerant plants instead. Adjust your irrigation system at least monthly to avoid over- or under-watering. Or, even better, install a smart controller to do it for you! Use hydrozoning techniques so only those plants needing additional water get it. Keep your garden green by keeping yard waste on your property by composting it into mulch. Mulch will feed the soil, keep it cooler and keep moisture from evaporating away. Plant shade trees on the south and west sides of your house to keep it cooler in summer. Grow your own vegetables and fruits; not only is it fun and rewarding, but it tastes better and we can avoid adverse effects from transporting produce over long distances. Feed the soil by using compost and mulch in the garden rather than synthetic fertilizers. It’s easy to use clippings from your garden to create your own. Avoid tilling the soil and soil compaction to encourage beneficial micro-organisms to feed your soil. Use mulch reduce evaporation and the number of weeds in your garden. Avoid the use of pesticides and other chemicals that kill both good and bad bugs. Remember, those good bugs, if left to do their job, will take care of most insect problems without much help from us! And let’s learn to live with a certain amount of damage…. after all, we aren’t perfect so why should our gardens be? Use of pesticides and herbicides should be done only as a last resort. Support your local birds and bees by massing plants that support beneficial insects in your garden, especially native plants. Be sure to provide a source of water and nesting sites for these beneficial insects, too.